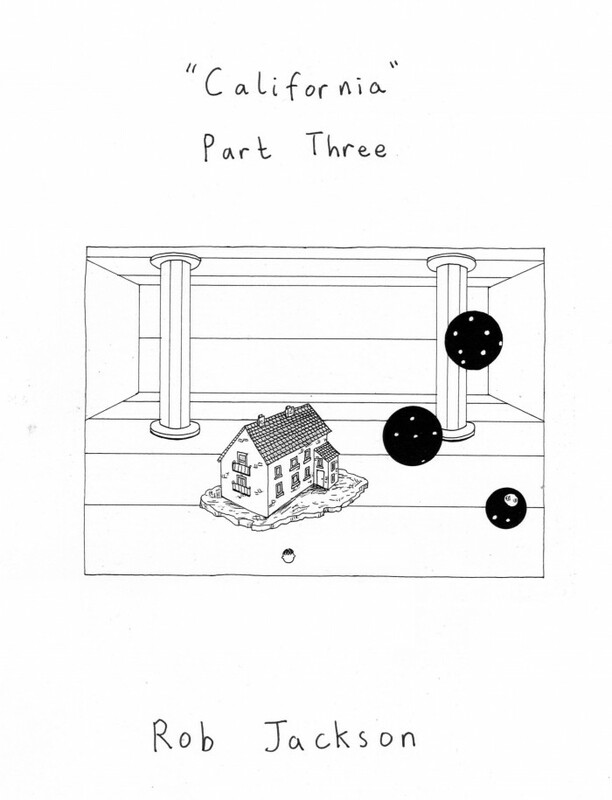 ‘California – Part Three’ is the third part of my California series of horror comics. Part four will be the final part and will be out in a month or so. Its 24 pages, black and white, A5 sized. Here we go then, the third part of Rob Jackson’s California, his low-key Lovecraftian horror meets homespun family saga – issue 1 was reviewed here, issue 2 here. And frankly you might be thinking that by three issues in Jackson would have thrown all the weirdness he could have at us yes? Or that by this point we should have some idea of where Jackson’s taking this one, yes? No. Absolutely no. Have we all not been paying attention to the reviews of Jackson’s comics so far, switching genre and subject with absolute alacrity? Sure, there were hints of Cthulish monstrosities before, but very little prepares you for the direction Jackson takes it in. Billy’s freaked out, Jake’s acting the innocent. But by the end of the issue things are going to get far, far weirder. Issue 1 introduced us to Billy and his family, heading out to California, with younger brother Jake beginning a flirtation with religion and power that we can all tell is not going to go well. In issue 2 Billy gets just a little insight into the sort of things that Jake might be involved in. They’re not nice and there’s tentacles involved. With no way back in, Billy seeks out elderly shamans to help him find his family once more. And then it gets VERY strange. But I’m not giving too much away with this review, as the real freakout is something great to behold, something completely unexpected. But I shall at least direct your attention to that cover once more…. the house floating in some weird multi-dimensional space, the dark spheres, the columns, the blank space…. and that small thing in front, the tiny round thing just below the house. Tentacles and teeth galore. It is all quite wonderfully strange. I’ll not show you that particular bit of weirdness, but here’s Billy just about to slip into his drug induced altered state …. ep. And THEN it gets really strange. So yet again Rob Jackson’s comics confound expectations. But then again, I’ve come to expect them to confound expectations. he does it so well, these raw, strange comics. It’s just this sort of thing that makes me warm so much to Jackson’s work every time. I’m tired of describing it as raw and rough by now. Sod that, Jackson’s style is Jackson’s style, and his wonderfully strange storylines have done little less than entertain and entrance since I first read his work. California is no exception. Acquired taste? Sure, but once you get it, you’re in for a great time.